The president’s office has today launched an online form titled “Dear President” for citizens to share their concerns with President Abdulla Yameen. 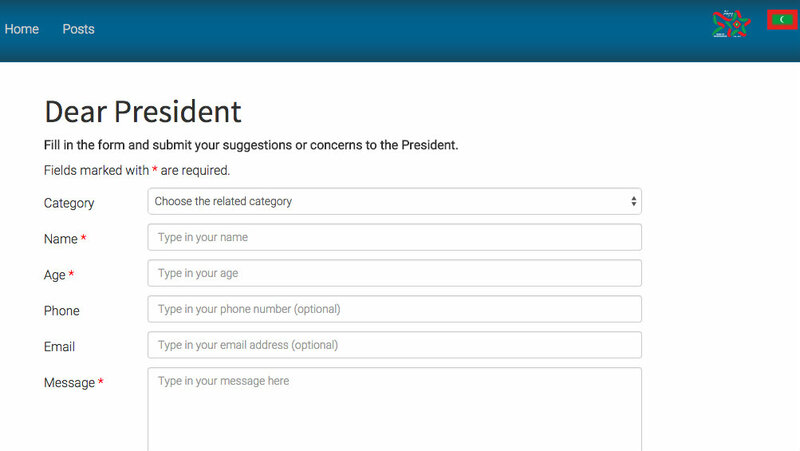 The form is available on the president’s office website, and allows the public to send comments, concerns and thoughts on agriculture, fisheries, tourism, education, health, housing, youth, sports or other. Members of the public are required to list their names and ages, while the email address and contact number is optional. The public affairs coordinator at the president’s office, Aishath Leeza, said the campaign is receiving a lot of public support. President Yameen and First Lady Fathimath Ibrahim have recently held several public functions to meet with the elderly and the youth. Late last month, the first lady visited chronically ill patients at the state-run Indira Gandhi Memorial Hospital (IGMH) and distributed packages of rice, dates and cans to the disabled in Malé and its suburbs Hulhumalé and Vilimalé. An eyewitness at the IGMH said he saw the first lady handing out envelopes with money to patients. But the first lady’s secretary denied rumours that she had distributed money to the sick at the IGMH. At the June 7 meeting with the senior citizens, President Yameen pledged to send 142 pilgrims to Hajj this year on government expenses. But president’s office spokesperson told local media two days later that the president’s remarks were misunderstood. The president had only pledged to secure placements for 142 senior citizens through the government-owned Hajj Corporation, he said. The first lady also met with the participants of the 30th National Quran competition last week. 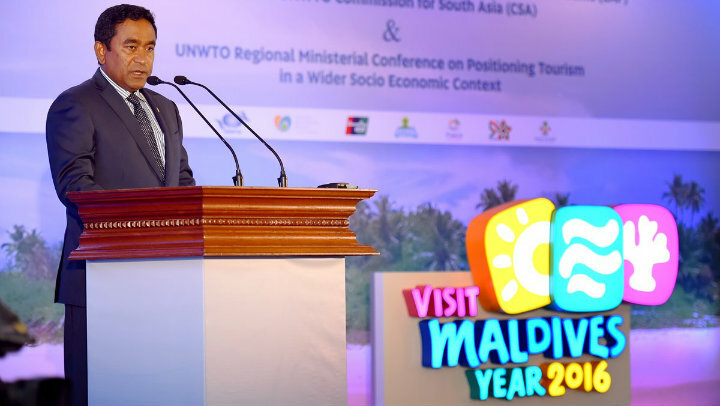 President Abdula Yameen is to travel to China on June 11 to visit the China-South Asia exposition and the Kunming import and export fair, local media report. The president is to give a keynote speech at the joint-opening of the two fairs. Leaders of the eight SAARC countries and Saudi Arabia will attend the fairs, Haveeru has said. The opposition has planned a mass protest for June 12 over the jailing of ex-president Mohamed Nasheed and ex-defence minister Mohamed Nazim. The Maldives will hold a second investment forum in China’s capital Beijing in September. “Beijing will be a perfect place for Maldivian businesses to promote their businesses and networking,” minister Mohamed Saeed said in a tweet in late May. This article is by former president Mohamed Nasheed’s climate advisor Mark Lynas. It was originally published in The Guardian. Republished with permission. Lynas has authored several books on climate change, including Six Degrees: Our Future on a Hotter Planet. The chair of Aosis is currently the Maldives, a country of hundreds of coral atolls, none of them more than a metre above sea level. The Maldives shot to global attention in 2009, when its charismatic president Mohamed Nasheed held an underwater cabinet meeting to raise awareness of his nation’s plight, and laterpledged to make his country the world’s first carbon neutral state. 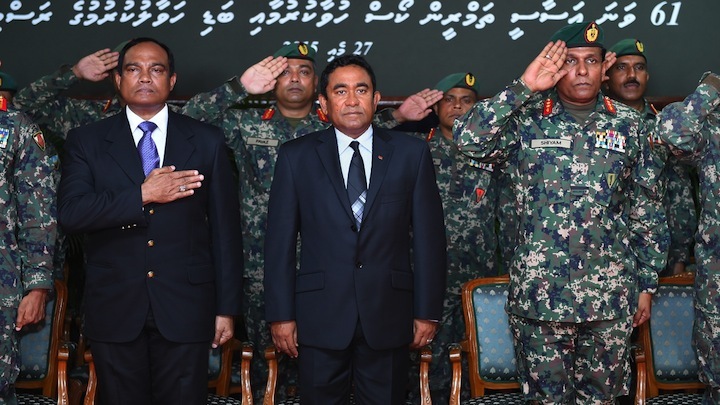 However, the Maldives is no longer represented by Nasheed,who was ousted in a coup in 2012 and later lost a rigged presidential election to the half brother of the former dictator. 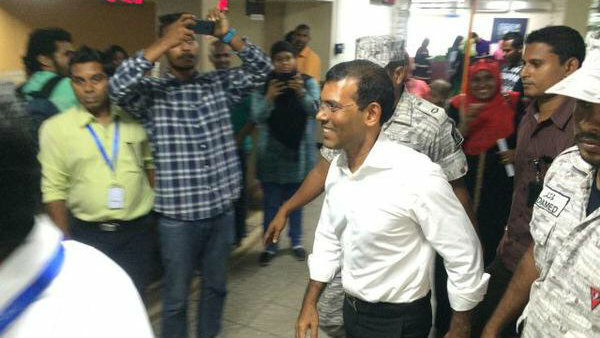 Nasheed was recently arrested, tried and sentenced to 13 years in prison following a politically-motivated trial Amnesty International decried as a “travesty of justice”. He is currently languishing in an unsanitary jail with highly restricted access to medical care, legal representation or visits from his wife and young children. 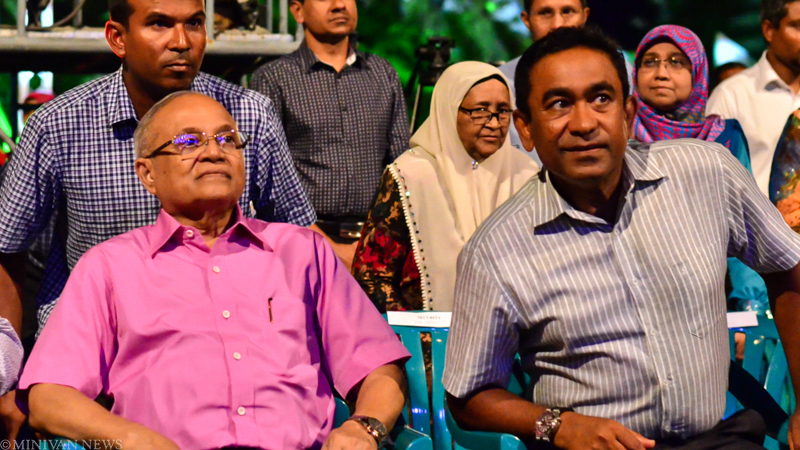 The Maldives’ new autocratic leadership has gutted the country’s democratic institutions and imprisoned every political opposition leader. The authoritarian president Abdullah Yameen has ditched the carbon neutral pledge and plans instead to drill for oil in the Maldives’ pristine coral-fringed waters. Yet this is the voice, as chair of Aosis, now supposedly representing the moral force of small island states at the international climate negotiations. Having some of the most vulnerable countries in the world representated by authoritarian regimes presents the world with a dilemma. 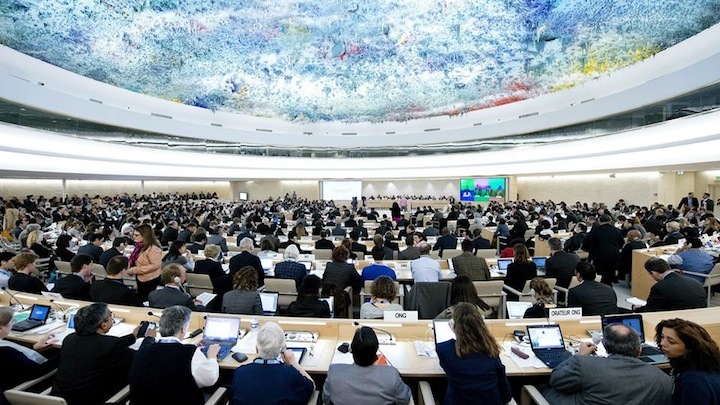 Should demands from these countries for billions of dollars’ worth of climate aid be heeded, when minimum standards of good governance are ignored and human rights are trampled? 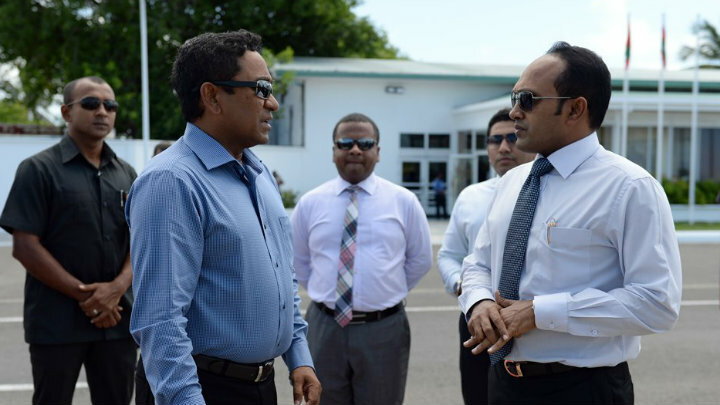 In the Maldives, Yameen’s ministers have been accused of links with international gangsters and drug-dealers. Corruption is endemic, while journalists have been threatened, beaten and disappeared. Islamic extremism, meanwhile, is thriving, with hundreds of Maldivians reportedly traveling to Syria to join Islamic State. This is not a call to reduce the amount of aid pledged in Paris: the $100bn target has been agreed and should be met. But there is surely now a strong case for setting up procedures to enforce minimum standards of accountability for countries aiming to draw from these funds. There are plenty of Aosis members and other vulnerable nations that respect democracy, human rights and good governance, from Barbados to Cape Verde to Samoa. These countries should be first in the queue, while nations like the Maldives that slip backwards into autocracy and corruption should be excluded from accessing climate finance support. In the meantime, Aosis should come to its senses and realise that it is damaging the interests of small island states worldwide to have its collective voice represented by a regime that crushes democracy and imprisons opposition leaders. Human rights and climate change cannot be traded off against each other. It is because human rights and dignity are accepted as universal values that there is a moral case for climate finance in the first place – to address the injustice of those suffering the worst climate impacts not being those who bear the most responsibility for global warming. Morality is a double-edged sword – if you behave unjustly yourself you forfeit any claim to moral leadership. That is why the Maldives cannot represent climate leadership while an aspiring dictator remains at the helm.